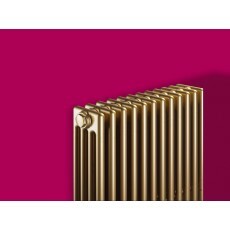 Radiators have several crucial characteristics. The most important of which - and don't let anyone tell you otherwise - is size. When choosing, buying and fitting radiators, their size should be your first consideration. There are many factors involved in choosing radiators - style, material and compatibility with your heating supply being important ones. But these are all useless until you've measured the areas you want your radiators to heat and worked out what size radiator you need. Getting the balance right with radiator size is critical. If your radiator's too big, you'll be wasting energy every time it's on - and you may be taking up unnecessary wall space. Then again, if your radiator's too small, you'll never get the heat output you need to get the temperature you want in the space. Meanwhile, your boiler will never be off, creating extra wear and tear on it - which won't save you any money in the long run either. Fortunately there's a simple calculation, which can ensure you get the right sized radiators for your home. A radiator's output is measured in British Thermal Units, more commonly referred to as BTUs. The higher the BTU rating of a radiator, the more heat output it will generate. Working out the BTU value you need from your radiators is a relatively simple calculation. Rooms with more doors and windows (especially single glazed ones) will need radiators with a higher BTU value than those without. A simple calculation you can do though is to calculate the room's volume (height x length x width, in metres) and multiply the result by 153. This will give you a rough idea of the BTUs per hour needed to heat it. To convert this to Watts, multiply the figure by 0.2931. Obviously it's unlikely that you'll find any radiators that match your BTU requirements exactly - but you can round up or down to find a close enough match. Once you've done the calculations and worked out what size you need you can start looking at the other features you need from your radiators. There's a wide enough range out there - so do the calculations and start choosing your radiators. Simply Radiators is a specialist in a vast range of radiators and designer heating products. Whatever style, size or material you are looking for, there will be something for you on our extensive website. Call 020 8884 3369 to find out more. Alternatively, you can email info@simplyradiators.co.uk and someone will answer your query as soon as possible. Simply Radiators is a leading UK supplier of traditional,contemporary, designer and feature radiators and we offer our customers a new perspective on radiator style, innovation and design.